Review: King Tuff, 'Black Moon Spell' On his third album, the D.I.Y. glam-rocker re-brands himself as some sort of demonic teenager. But Black Moon Spell is, at heart, the sound of one guy making sure everyone around him has a good time. 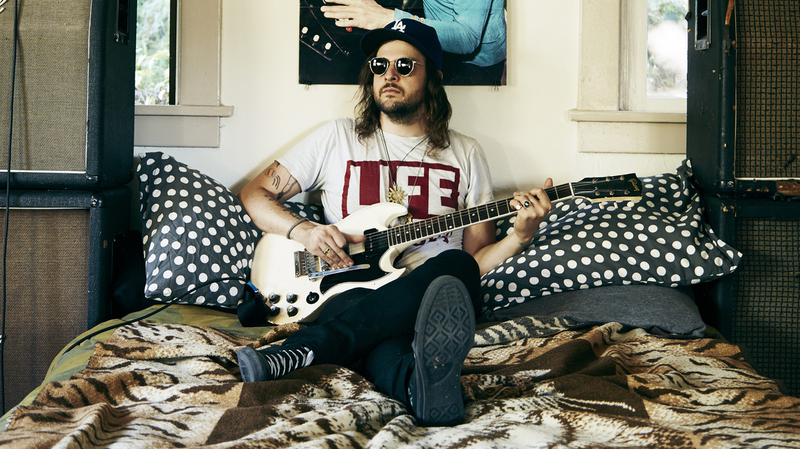 King Tuff's new album, Black Moon Spell, comes out Sept. 23. Vermont native King Tuff, a.k.a. Kyle Thomas, has been prowling the corners of the D.I.Y. scene for years, both in this solo guise and as a member of several vastly different acts: the freak-folk outfit Feathers, the wunderkind pop band Happy Birthday, the doom-metal burner Witch. But until Black Moon Spell, he hadn't really pushed his persona so far in a single direction. On his third full-length album, Thomas re-brands himself as some sort of demonic teenager, out for kicks, laughs, and maybe a little mailbox baseball, as opposed to bloodshed and the apocalypse. It makes for a fun, evocative ride through four dimensions of rock music, paired by decade-straddling jumps through nostalgia loops: the '70s glam scene's repurposing of '50s greasers, JDs, and teenage sci-fi/comic-book culture, as well as '60s psych and garage sounds re-evaluated through '80s metal. Unfettered by real responsibility to any of these time periods, King Tuff melts down dozens of crucial 7" singles and fashions them into a spear. Thomas wins the 2014 glam-rock revival, plain and simple; Black Moon Spell is loaded with sterling examples of the genre from front-to-back. From the opening guitar buzz of the title track, those familiar with King Tuff's output will recognize this as Thomas' heaviest work to date, a straight-up ripper that recasts Marc Bolan's cherry-lipped swagger against Danzig's writhing "Twist Of Cain," a crossover so simple you'll wonder why no one's really pushed it this far before now. Thomas and his band — including a guest spot by Ty Segall on the drums — runs through 13 more tracks that cover a wide range of styles, occasionally slowing down for a reflective look into druggy, dysmorphic abandon ("Magic Mirror"), soaring rock anthems that melt into sugar ("Eyes Of The Muse"), and high-school-prom slow-dances ("Staircase Of Diamonds") that conjure the heyday of Alice Cooper. Production efforts by Bobby Harlow (The Go, Conspiracy Of Owls) emphasize every fine point in the bunch, complementing this set in the best ways. Elsewhere, it's business as usual for King Tuff, and business is brisk: It's got hyperactive tributes to record stores ("Black Holes In Stereo"), hard-charging rockers with irresistible choruses ("Headbanger"), and odes to women ("Beautiful Thing" celebrates a wanton descent into tattoos and vandalism, before running headlong into the minute-long "I Love You Ugly"). While Black Moon Spell feels deliberate, it never comes off as calculated. It's just one guy making sure everyone around him has a good time.